Hi everyone, Deanna here with another project for the Dies R Us Inspirational Blog. Here is what I have for you today. For the card base I started with white card stock cut and folded to make a 4 1/4" X 5 1/2" base. I added a blue mat cut at 4" X 5 1/4". I then added a strip of green cut at 4" X 1 1/2" and added that to the bottom of the card. Next I die cut the Summerville Landscape die from Memory Box out of white card stock. I then colored the cut with some copic markers. Next I cut the tree using Dee's Distinctively Dies and the Tree Base 1 die. Next I cut the tree greenery also from Dee's Distinctively Dies using the Tree Toppers Die. If you haven't checked out the Dee's Distinctively Dies yet, you should. They offer a wide variety of dies. 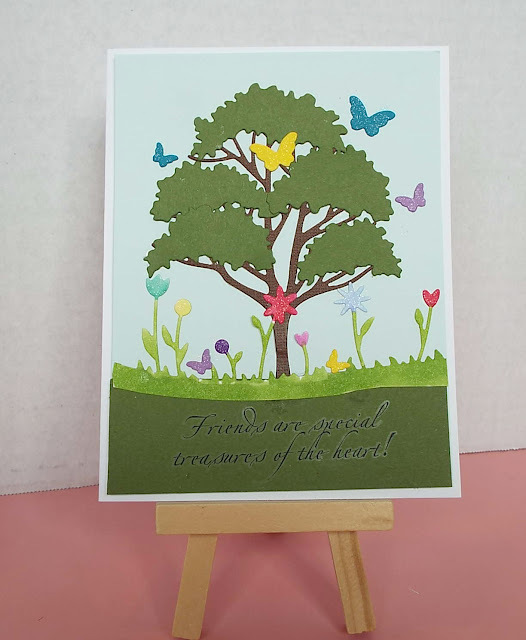 Once I assembled my tree I added it to my card front along with the landscape die cut. To some splashes of color to the card I used the Poppystamps die Butterfly Sprinkles to cut out several butterflies in different colors and added them randomly to the card front. Finally, to finish the card, I added some Wink of Stella Clear pen to the flowers and the butterflies. Love that big beautiful tree! And of course your lovely butterflies and all of that glittery goodness! A gorgeous scene you have created, and I love the sentiment. I love tree cards and your's is amazing. Very colorful and cheery. Thanks for sharing. very sweet scene, love all the sparkle and the sweet sentiment to go with it! What a cheerful spring scene you've created! The big tree is awesome and is one that's on my wish list. It may have to go in my shopping cart on my next order now that I've seen it in action on your adorable card!